Pete's Blog & Grille: Oh write your own damn headline with "scoop" in it. I'm too pooped. Oh write your own damn headline with "scoop" in it. I'm too pooped. Sign number-one that we live in the wealthiest society of all time? We use real folding money to buy something called kitty litter, and that kitty litter actually comes with something called supplies. Specially manufactured items for cat poop. There's a pet-supply store on my block called the Kennel Cafe and when I entered an hour ago, without a hi-how-are-you, I told the clerk I needed a new kitty-litter scoop and he pointed me to a door, saying, "through that door on the left--all the kitty-litter supplies." Sign number two: There were at least eight different kinds of kitty-litter scoops on offer. 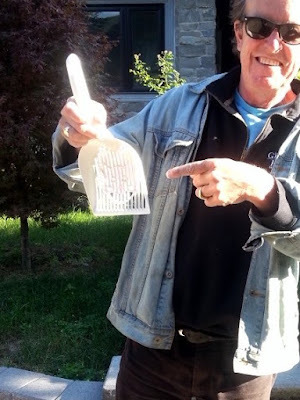 Three: I didn't just grab the one handiest to me; I actually compared the various kitty-litter scoops and hung the first one I picked up back on the display wall. It was a pretty blue and all but as soon as I had it in hand I realized it was a bit big and might not be perfect for getting at the lumps in the corners of the kitty littler box. 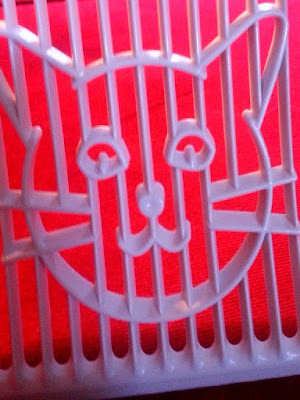 Four: I chose a smaller one that actually has a little kitty's face extruded into the scoopy part. 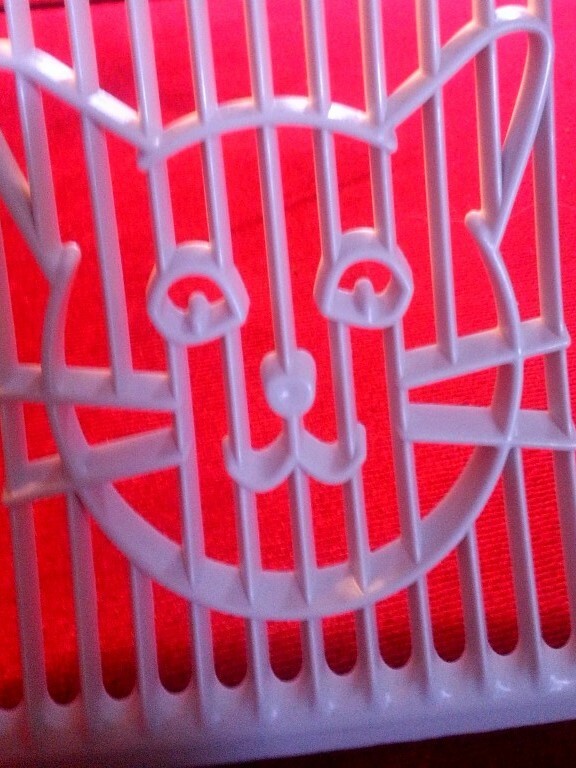 But it wasn't the cat-shaped grate that sold me. And neither did the fact that the label promised: "CLEANS IN SECONDS!" "Easily SAVE 30 to 72 hours a year!!" with two exclamation marks. I took my new scoop over to the clerk and said, rather exclaimed, "this scoop is going to save me 30 to 72 hours a year!!" 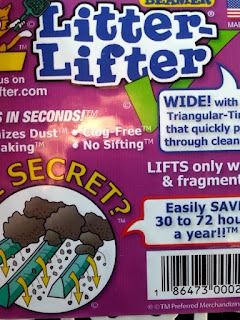 I continued: "If I thought I spent more than 30 hours a year cleaning cat litter, I'm not sure it's worth going on any longer." And added; "That's a pretty big gap. Between 30 and 72 hours! How do you suppose they measured? Do you think they monitored people?" Me: "I have a few Carleton University credits I earned with less time invested than that." I bought it anyway. And as I walked home, a little discouraged at the thought that I might actually use, like 40 hours a year scooping up after our cats Kiwi and Iris who don't really contribute that much to my otherwise busy life, I stopped an off-duty security guard and asked her to take that lovely photo of me and my new scoop. I asked her if she thought 40 hours on litter duty was a lot. "You might," she said, "be surprised, if you actually counted." I will, however, heed the advice on the label and follow the scoop-manufacturing company--BEAMER--on Facebook and--with more enthusiasm--Twitter. Under normal circumstances I'd take the opportunity to make some sort of joke about litter on twitter but it's been a long week and I'm a busy guy. I don't have time to waste on crap like that.